We made an impromptu trip to the Smithsonian National Postal Museum on a rainy Saturday a couple of weeks ago. It was actually my first time at this museum, but I’m so glad we went – it’s now on my must-visit list for DC! The stamp collection alone is worth a visit, but there are also exhibits on the evolution of the postal service, from the original private letter carriers to the Pony Express to the modern U.S. Post Service, and a display of mail delivery vehicles and airplanes. Sophie even had fun at the museum pulling out the displays in the stamp gallery and pretending to drive a mail delivery truck! The National Postal Museum is located in Northeast DC next to Union Station, and is housed on the lower level of the historic City Post Office Building, which was constructed in 1914 and served as the DC post office from 1914 to 1986. I love these old buildings – the architectural details are amazing! The Museum also houses a 6,000-square-foot research library, a stamp store, and of course a museum shop. The stamp collection is amazing – not that you’d expect anything else! Everything from the first postage stamp to mail sent from the Moon, examples of engraving dies used to make antique stamps, and tons of international stamps. As you can probably tell, the National Postal Museum is very kid friendly (which I love!). We’re looking forward to going back! 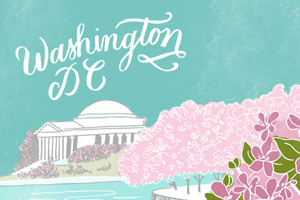 More fun things to do in DC right here! Thank you so much for sharing this outing! We’re hoping to get up to DC soon, and this will definitely be on my list. Oh, I hope you can make it! It’s a great place to visit, especially in the spring! What a cool field trip! When the postal service is under scrutiny and getting bad press, it gives me new appreciation to see all this wonderful history. Thanks for sharing! YES! USPS provides an amazing service and it’s so sad to see them go through such difficult times these last few years. I still marvel that we can send a letter to any part of the country for less than a dollar. The exhibit on the evolution of mail delivery is really incredible. Wow, thanks for sharing! I lived in DC for years and never knew this existed. I’ll definitely check it out when I’m back in March. I totally know the feeling – I’ve been here for more than 10 years and didn’t know it existed until just a couple of years ago. It’s definitely a hidden gem amongst the Smithsonian museums. March sounds like the perfect time to visit! It looks amazing! I live in The Netherlands, so won’t get a real change to go, but I’m so thankful for these amazing photo’s! Hi Monique! Thank you so much for reading from the Netherlands! Wow! I’m going to DC in August and will actually get to visit museums (unlike the last 2 times I went)- this has been added to my list. Thanks!